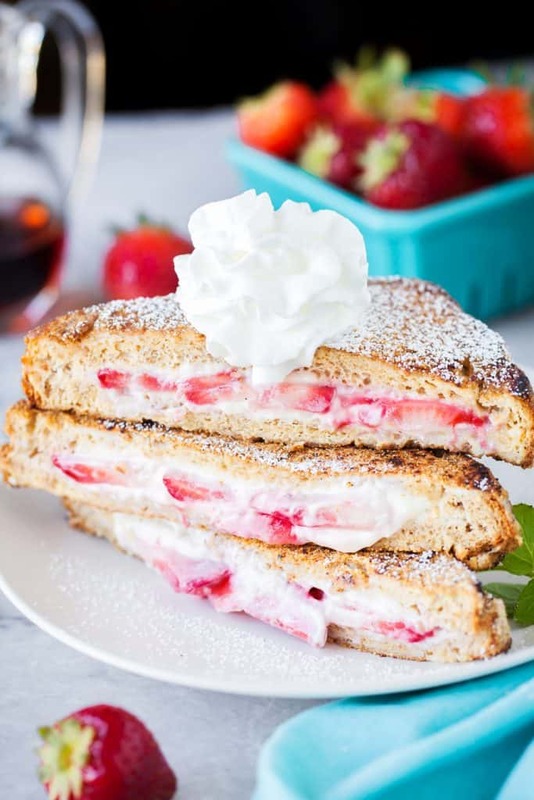 This cream cheese strawberry stuffed French toast is covered with a cinnamon and sugar coating and filled with cream cheese and juicy strawberries. I don’t remember exactly where I was the first time I experienced stuffed french toast. The memory is a complete haze, I was probably so overcome with joy that everything just shut down for a moment. I do recall that I was on vacation, somewhere tropical and warm. So, whenever I make this dish, it reminds me of being somewhere fancy, and this recipe IS super fancy. It’s like a cheesecake and a breakfast pastry all wrapped up in a syrup bow. When we can, we will pick strawberries fresh from the patch. Farm fresh strawberries are so much sweeter and are filled with so much of that strawberry flavor. If we can’t get them here yet, we try to go to the farmers market for them. There is nothing better than a strawberry that just was plucked. So, I know it looks like this was ridiculously difficult to put together. 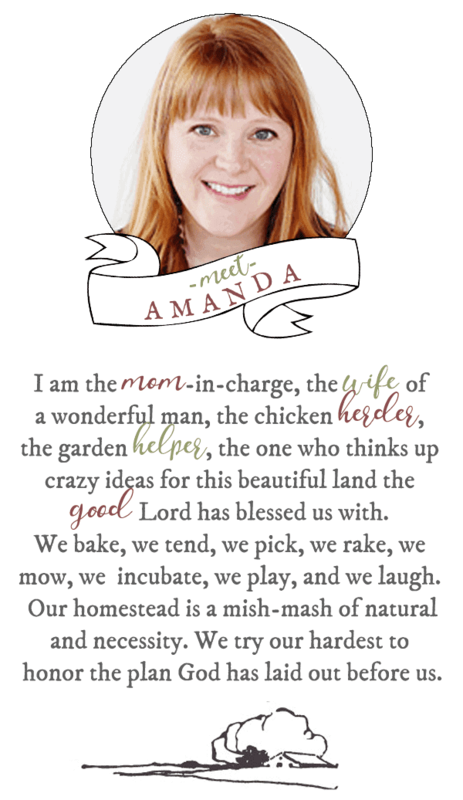 I would roll with that assumption if you are trying to impress your guests. The truth is, it really isn’t that hard to pull off. You are basically going to put the cream cheese mixture on two slices of bread. Add fruit to the middle and put the slices together like a normal sandwich. The hardest part is sealing the edges. You just have to mold the bread to seal in all of the amazing fruit and cream cheese. From there its just like your normal, average, every-day french toast. I feel like I can turn my nose up to “normal” french toast now that I have made this version. You simply soak both sides in your egg/spice mixture and then place it in a frying pan to brown (on both sides). Top the whole thing off with some powdered sugar, some syrup, or some whipped cream (all of the above for this one), and you are set! In a medium bowl, whisk together the eggs and milk. Set aside. In small bowl, combine the bread crumbs, sugar, and cinnamon. Pour into a shallow bowl. Set aside. In a small bowl, stir together the cream cheese and honey until smooth. Spread two slices of bread with half of the cream cheese mixture. 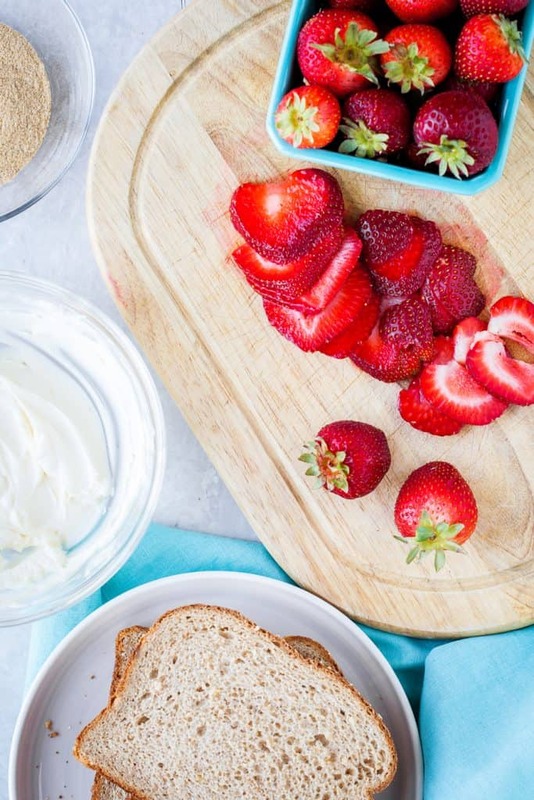 Top the cream cheese of one slice with about 4 to 6 slices of strawberries, leaving about 1/4-inch border. Cover with the other bread slice, cream cheese side down. Working around the entire border, firmly press the edges together, until entirely sealed. 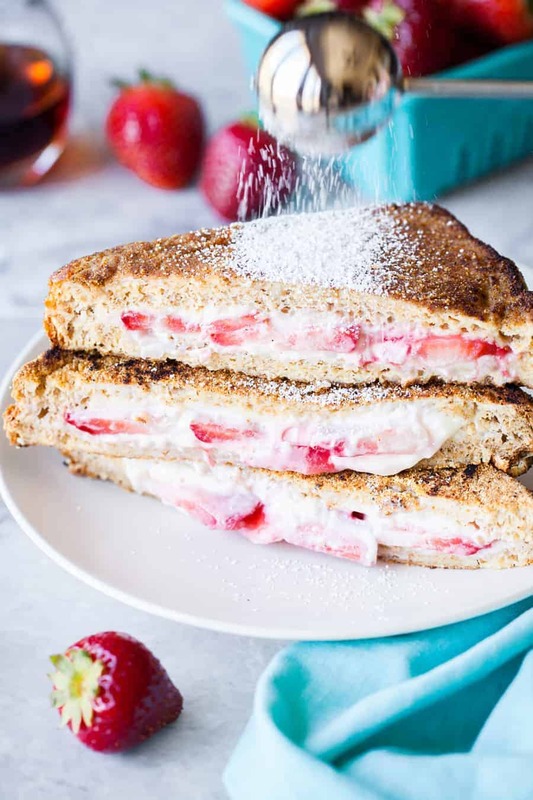 Repeat with remaining bread, cream cheese mixture, and strawberries. Coat entirely in the egg mixture followed by dredging in the bread crumb mixture. In a cast iron skillet over medium-high heat, melt the butter. Cook the toast for about 3 minutes, until golden. Flip and continue cooking until crisp and golden brown. Repeat with remaining toast. Sprinkle with powdered sugar and a dollop whipped cream. Serve with maple syrup. 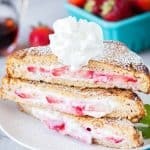 Did you make Cream Cheese Strawberry Stuffed French Toast? Adapted from Savory Nothings. Photography by The PKP Way.